Has your mom ever dated a guy that you despised, or who made you wonder why she was even attracted to him in the first place? Well my mom has. Recently I’ve been thinking about this particular subject, and I think it’s true that a lot of teens don’t like the person their mom is dating. Why? Although everyone will answer this question differently depending on their situation, I think this happens because we feel our mothers deserve the best. For example, when teens are a part of a single family home and have seen their mom’s past relationships go bad, they sort of experience the pain and heartbreak with her. They realize that their mom deserves better than what she is getting. Obviously no one likes to see their mom suffer, so teens (especially guys), tend to be a little overprotective when it comes to other male figures in their mom’s lives. 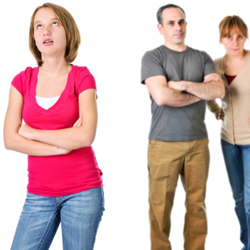 Some teens may also feel upset and worried that their mother’s boyfriend is going to replace their biological father. On top of that, they wonder if their mother is going to spend as much time with them, or whether she’ll be busy trying to make her boyfriend happy. It’s perfectly normal to feel this way, but it can also be a bad thing if you don’t try to get to know your mother’s boyfriend and what he’s all about before judging him. Consider giving yourself a substantial amount of time to get to know your mom’s partner before jumping to conclusions. This will help improve the relationship between you and your mom and it will likely decrease the tension in the household. So, my message is that even though most of us have moments when we may be upset, it’s best to get to know someone before judging them. Even though some guys may seem to be bad news at first, you should give it time and remember that your mother deserves to be happy too. If you still feel that your mom is making a bad choice after getting to know her new partner, have a heart to heart talk with her and tell her about your concerns. If you feel that she won’t listen to you, talk to a grandparent, aunt, school counselor, or another trusted adult.